Vernier temperature sensors are durable, accurate, and versatile for all types of science experiments in and outside the classroom. The Go Direct Temperature Probe is a rugged, general-purpose temperature sensor. It directly connects wirelessly via Bluetooth® or wired via USB to your device. The Go Direct® Surface Temperature Sensor is designed for use in situations in which low thermal mass or flexibility is required. It directly connects wirelessly via Bluetooth® or wired via USB to your device. The Go Direct® Wide-Range Temperature Probe measures the temperature of a distillation safely and wirelessly within a laboratory fume hood. It directly connects wirelessly via Bluetooth® or wired via USB to your device. The Temperature Probe is a rugged, general-purpose temperature sensor. This sensor connects to a Vernier interface in order to collect data on your device. A rugged, general-purpose, wireless temperature sensor used to remotely monitor temperature. Great for use with iPad! Collect temperature data directly through the USB port of a computer, Chromebook, or a LabQuest interface. Using the FLIR ONE thermal camera and our free Thermal Analysis app, students can collect temperature vs. time data for up to four spots or regions, along with a thermal image video. Features a wide temperature range (–20 to 330°C) for melting point determinations of most organic compounds. This sensor connects to a Vernier interface in order to collect data on your device. Important: For use in air and water only. Designed for use in situations in which low thermal mass or flexibility is required. This sensor connects to a Vernier interface in order to collect data on your device. Features a 30-meter cable for measuring temperature in lakes and streams. This sensor connects to a Vernier interface in order to collect data on your device. A simple and rugged sensor designed to measure temperature in the range of –200°C to 1400°C. This sensor connects to a Vernier interface in order to collect data on your device. Collect temperature data on a compatible Texas Instruments handheld. Collect temperature, relative humidity, and pressure data on the Kestrel LiNK app for iOS and Android devices. 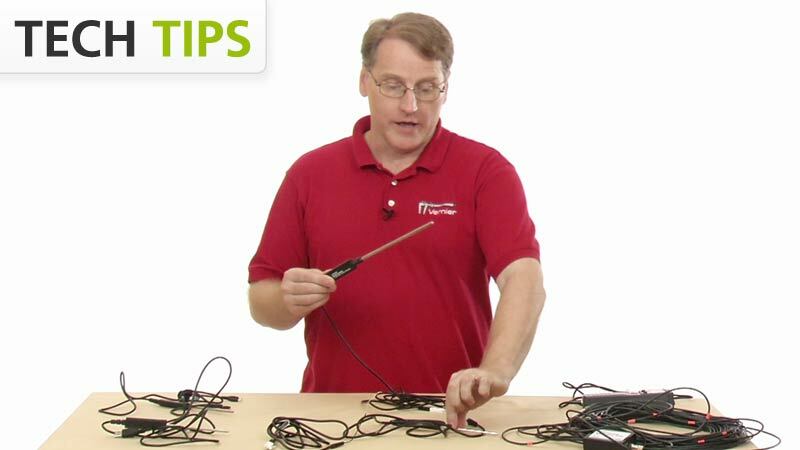 David Carter explains the differences between Vernier temperature sensors.